A day after the historic announcement of Pope Francis’ intention to visit Philadelphia next September, the reality of the challenges and joys of the event is sinking in for planners, civic officials and ordinary Catholics in the Archdiocese of Philadelphia. 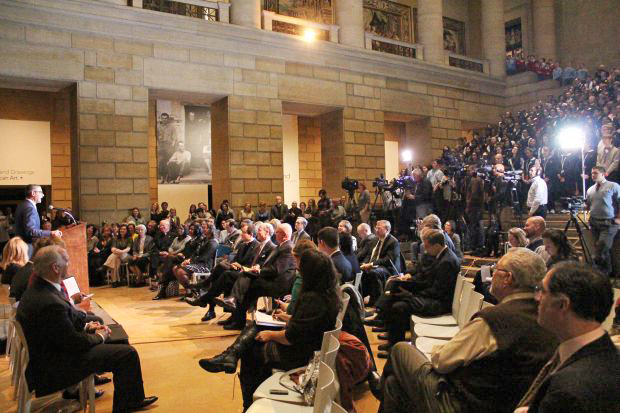 The “once-in-a-lifetime chance for Philadelphia to shine,” as the World Meeting of Families Executive Leadership Committee chairman Daniel Hilferty called the September 2015 congress that will be capped by the papal visit to the city, will require unprecedented coordination and support. He said the fundraising effort was “more than halfway toward the goal” of $45 million for all projected costs and contingencies. Philadelphia Archbishop Charles J. Chaput has said he plans to announce the status of fundraising efforts early in 2015. That is just one of the issues facing organizers before next fall. One thorny issue had been the inability for people registering for the families’ meeting also to secure hotel rooms for the three days of the papal visit – because it was unconfirmed, the rooms were not made available. Now they can be booked — register for the congress here. Those challenges and others stem from the immense throngs of people expected for the week-long events. About 15,000 people are expected to attend the families’ congress at the Pennsylvania Convention Center Sept. 22-25 in two tracks – one for adults with keynote talks and break-out discussions, and another track for children and teenagers with an emphasis on hands-on activities. That would make it the largest convention of the year for a city used to hosting such gatherings. The first major public event attended by Pope Francis will not take place until Saturday evening, Sept. 26 at the Festival of Families, a cultural celebration expected to draw up to 800,000 participants. The pope’s presence will swell the number of people coming to the city in the days prior, along with the congress participants and thousands of weekday workers in center city. These are good problems to have because all those people will be studying and discussing the roles of the family and its presence in society at the congress, and expressing their faith publicly with the pope especially at the Mass he will celebrate Sunday, Sept. 27 at the steps of the Art Museum. Gerald Davis, a member of St. Isaac Jogues Parish in Wayne and a trustee of St. Charles Borromeo Seminary, expressed nothing but confidence as he reflected on the yesterday’s announcement. Davis believes “Divine Providence brought the Holy Father to us,” and said he has been praying to Jesus and Mary for just such a visit by Pope Francis and for his intentions ever since his election as pope in March 2013. “I felt it was going to happen. It’s going to take a lot of work to make this a success. 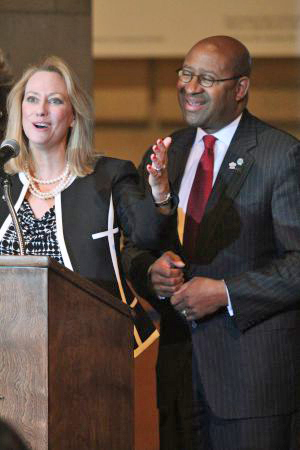 We need all hands on deck, and I am confident, with God’s grace, we will make it,” Davis said. Another effect of Pope Francis’s visit, according to Eustace Mita, will be unity, and it will be felt for decades in the Philadelphia region. “Pope Francis is having a tremendous impact because he truly is the pope of unity, bringing Catholics and non-Catholics together,” said Mita, a member of St. Mary Magdalen Parish in Media and a member of the World Meeting of Families’ board of directors. Obviously excited as were thousands of people throughout Southeastern Pennsylvania and beyond, Mita knows what he would tell Pope Francis next September if he had the chance.